The World Health Organisation (WHO) has advised tourists and business people not to travel to Hong Kong or parts of China because of the outbreak of a deadly, pneumonia-like virus. The WHO said anyone intending to visit Hong Kong or Guangdong province "should consider postponing their travel until another time". The view has been echoed by Professor Sir Liam Donaldson, England's chief medical officer, who said people travelling to these areas would be at "significant risk". The warning came after China said nine more people died from Severe Acute Respiratory Syndrome (Sars) in Guangdong last month, bringing the worldwide death toll to 78. The WHO says the outbreak there has still not been contained. 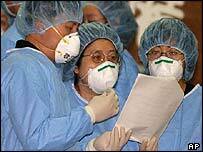 But government officials in Hong Kong said they were winning the battle against Sars. It said the travel restrictions advised by the WHO were "understandable". More than 2,200 people have been infected worldwide, causing widespread fear and the imposition of emergency measures. The WHO estimates Sars will prove fatal in around 4% of cases, usually where the person has an underlying condition such as diabetes or a weakened immune system. But it said that in 90% of cases, people seem to recover around a week after being infected. The WHO said it had for the first time been invited to visit China's southern province of Guangdong, where Sars is believed to have first appeared last November. Since then the illness has spread to more than a dozen countries. It is not clear if it is transmitted by sneezing and coughing, or by other means as well. The WHO said it was issuing the travel advice "because of the fact that we don't completely understand the means of transmission in Hong Kong and because since 15 March, tourists and businessman have returned from Hong Kong to their countries with infection". It said the advice did not apply to other areas, such as Singapore, Vietnam or Canada, where outbreaks have been effectively contained. It is the first time in more than a decade that the agency has advised travellers to avoid a particular area. The WHO said it had received a verbal invitation to visit Guangdong after waiting a week for the go-ahead in the Chinese capital, Beijing. "It'll give them [the WHO team] a tremendous opportunity to look at what appears to be the source of the outbreak first hand," said WHO spokesman Chris Powell. The travel warning came amid growing criticism of China for being slow in releasing information about the illness. Sars was only linked to Guangdong province last month by WHO experts piecing together data gleaned from Chinese authorities. As well as the latest deaths in Guangdong, China said there were 361 new cases in the province in March. Health officials said several cases of Sars have also been discovered in Shanghai, China's second-largest city. Meanwhile, Canada, the worst-affected country outside Asia, said two more people have died from Sars in Toronto, bring to six the total number of fatalities in Canada. A United States passenger plane was quarantined at a California airport after several people on board reported respiratory problems, which they believed to be Sars. The American Airlines flight from Tokyo was held for two hours at San Jose International Airport, but none of the cases proved to be the virus and passengers were allowed to leave. Reflecting growing concern over the illness, the United States has reduced its diplomatic presence in Hong Kong and Guangzhou, China, with non-essential staff offered free flights to leave. The Canadian authorities have restricted admissions and visits to hospitals, and thousands of people in Ontario, who might have been in contact with hospitalised victims, are in voluntary quarantine. In Malaysia, the first suspected death from Sars was reported on Wednesday. Brazil reported its first suspected case on Wednesday. Singapore Airlines says it is to cut 60 flights a week because the spread of the virus has caused a fall in demand for travel. In Thailand a man from Hong Kong dies of the virus in hospital on Tuesday night. Hong Kong health officials announce 75 new cases of Sars on Tuesday - making a total of 685 cases and 16 deaths. France, the US, Canada, the Republic of Ireland and Australia have recently issued advice to cancel or "re-consider" trips to the affected regions. "Hong Kong is desperately trying to protect itself "